This information is from a gentleman Steve Sewell that really gives great points in helping to identify what E.G.Booz you have.Steve and i both love research and he was very very good at it, he passed and is missed by all who knew him. These are some of the most desired and pricey bottles available in the bottle collecting world. post Clevenger straight and beveled roof versions for the ability to determine an original BOOZ from the Clevengers. Only one GVII-5 original BOOZ exists and that is in the Corning Museum of glass. the roof in the mold to achieve this. in the years 1858 through the 1860s and right on up to 1870.
an age probably a little to young to be a Liquor Merchant. The original bottle had a paper label wrapper that depicted an early American cabin. On the rear of the bottle on the roof is the date in bold font 1840.
presidential Campaign Log cabin and hard cider in the year 1840.
existence before the year 1856 as the city of Philadelphia had renumbered their streets in that year. The reason the city renumbered was simple the Center City portion was growing and it was easier to label blocks in the city as the 100 block 200 block etc. The old address of Boozs store would have been 26 Walnut street. Booz also had a property directly behind 120 walnut street at 15 Granite street. In the Days the famous Dr.Dyott had his store front at second and Race Front street being located on the river was where all of the business's that shipped goods via the Delaware river. This was only three city blocks from where Booz had his business on Walnut Street. In fact all of the important business locals were on the river for easy access of shipping of goods. 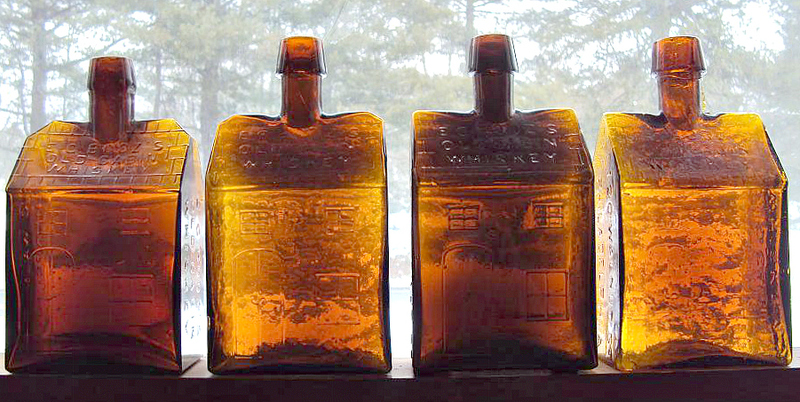 There is sound justification that the mold maker who the Whitney glass works used for the bottle modeled his cabin in the image of a glass workers home which in the early 1840s through up to 1970 dotted the landscape surrounding the old Whitney Glass works location in the heart of Glassboro. 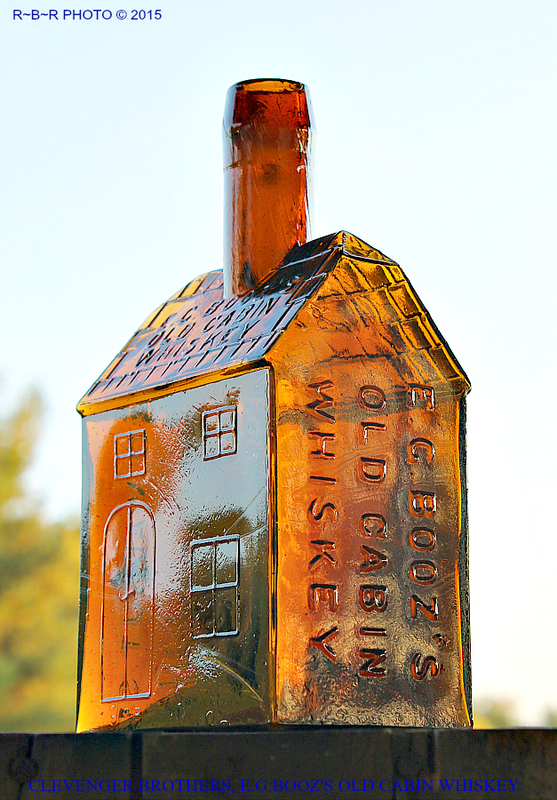 The glass workers lived in small modest 4 room 2 story homes shaped exactly like the Booz bottle.When you peeled the label off the bottle it now closely resembled the glass workers homes. The last vestiges of these old homes came down in 2007 as part of the down town revitalization project the town of Glassboro was instituting.Glassboro has done a terrible job preserving its rich glass industry. Only a handful of the original colonial homes still stand today.The 5 point intersection where the Stangers had founded the second glass works in New Jersey in 1775 has lost all of its historic charm with the original Stanger mansion house as the only standing structure from the original works. 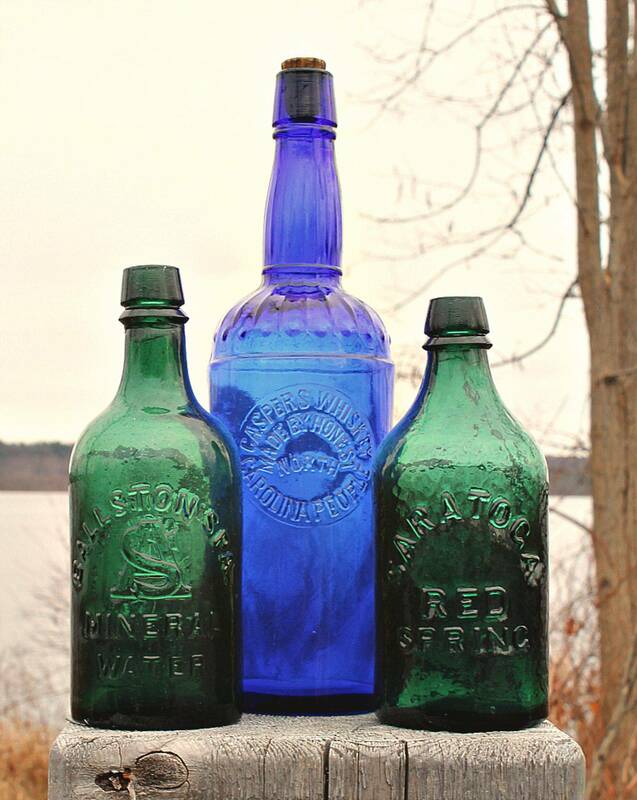 Here are the Characteristics and measurements of the original Booz bottles. The bottle was blown in a hinged mold which opened and closed diagonally. the gather of glass when blowing into it and than opening it when he was finished blowing the bottle. bottle was placed into the annealing oven which had a lower temperature than the main furnace which allowed the bottle to gradually cool. Width of the bottle: 4 1/16 inches. Depth of the bottle: 2 7/8 at the base and 3 inches at the roof line. The neck and lip 1 3/4 inches in total height.Finished with an applied sloping collar. The Base of the bottle: Smooth with a circular impression 1/8 inch in depth by 2 7/8 in circumference. The roof line: Straight ridge 4 inches in length. The front Roof design and embossing:The roof has 5 square rows of shingles in various sizes. The roof is 4 inches wide by 2 3/4 inches tall. 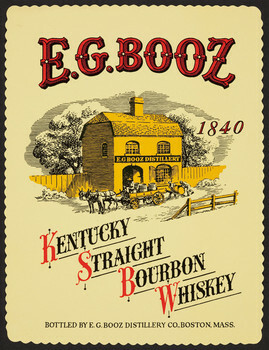 The following inscription : E G BOOZ'S OLD CABIN WHISKEY in 3/8 inch font. The rear roof design and embossing : The roof has 5 square rows of shingles in various sizes. The following inscription : 1840 in bold larger 1/2 inch font. The right side: The embossing in three rows E G BOOZ'S OLD CABIN WHISKEY. The back side of the bottle: Smooth plain no inscription a large label was placed here originally. To identify an original Whitney made GVII-3 straight roof Booz from the Clevenger version are as follows. You should be able to draw a straight line down through these letters where they line up. 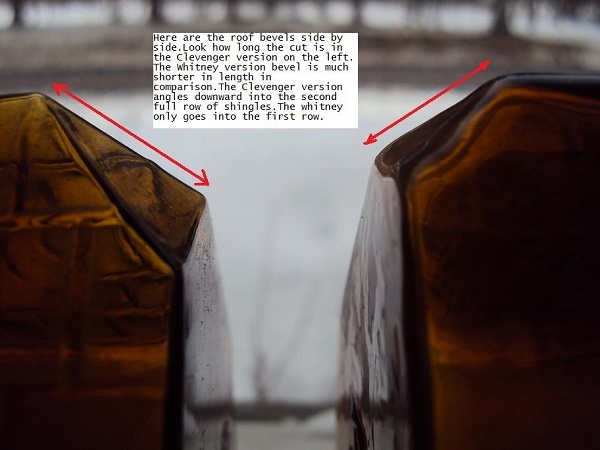 The letter K in the word WHISKEY on The side of an original Booz bottle is wider in the top fork of the letter. On the Clevenger version the same letter K is larger on the bottom fork of the letter. 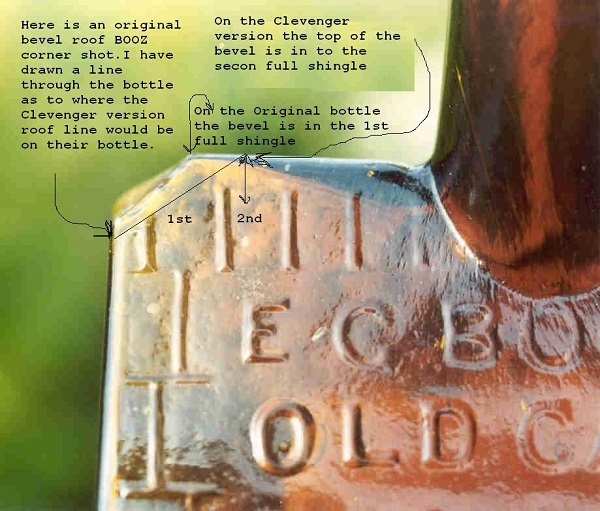 The Clevenger version of the bottle.This is a picture of the side of the bottle.Look at the word WHISKEY. from their Clevenger made counterparts.